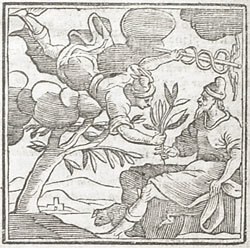 Alciato at Glasgow: Emblem: Facundia difficilis. Mercurium hoc Ithaco fama dedisse fuit. Purpureus sed flos, lactis & instar habet. Sed multi res est tanta laboris opus. According to the story, Mercury gave to the man from Ithaca this antidote to the poisoned cup of Aeaean Circe. They call it moly. It is hard to pull up by its black root. The plant is dark, but its flower is white as milk. The brilliance of eloquence and readiness of speech attracts all men, but this mighty thing is a work of much labour. 1. See Homer, Odyssey, 10.270ff. for the story of the encounter of Ulysses (the man from Ithaca) and his crew with the sorceress Circe on the island of Aeaea. The plant moly is described ibid, 302-6. See Emblem 76 ([A21a076]), for the effect of Circe’s poisoned cup. Cf. Erasmus, De Copia (Loeb edition, 1.91 D), where moly is interpreted as wisdom rather than eloquence. Cf. Coustau, ‘In herbam Moly, ex Homero’ ([FCPb073]).